FA: Phil Bard, Paul Tradani, August 1983. Reachy on medium sized knobs at the crux, and runout on easy terrain at the top. 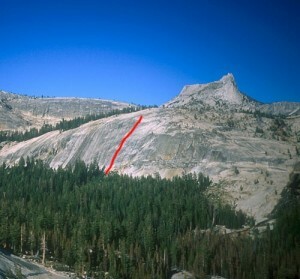 You can either climb left from the last bolt, or head straight up easier knobs on a big runout to the top ledge. A single ¼” bolt marks the original finish of the route, and you can go about 25 feet either way on the 5th class ramp/ledge to a good anchor. Which SuperTopo guidebooks include a topo for Old Folks Boogie?